It's the only Internet holiday. Say thanks to Techies for all they do! The Cheese Weasel may visit you April 3rd! 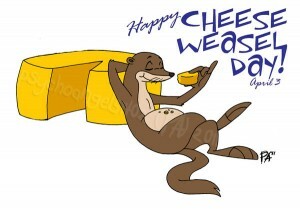 *Cheese Weasel Day is celebrated the following Monday if the 3rd falls on a weekend. Cheese Weasel Day 2012 is Next Tuesday! Okay, here’s your one month notice! Tell someone today about CWD and ask if they’d help spread the word. Even if you just post a blog it can help us raise awareness! Follow us on Twitter @CheeseWeaselDay and give us a shout out about what you’re doing. What is Cheese Weasel Day You Ask? Arrange secretly for a slice of cheese to be placed under the mouse pad of a tech person you know and appreciate. Plan a Cheese Weasel Day party with all the trimmings. Melt fondue, make grilled cheese sandwiches, eat nachos, anything cheesy works. Send a link to the Cheese Weasel Song and learn it so you can use it at your own CWD celebration. Get all the cheesy updates delivered via email!